Lawyers’ Rights Watch Canada (LRWC) thanks the Office of the High Commissioner for its report[1 on Sri Lanka’s implementation of Resolution 30/1. Four years after the adoption of Resolution 30/1 there has been virtually no progress towards investigating or prosecuting atrocity crimes in Sri Lanka and little or no progress on implementation of other commitments under the resolution. Instead, the Sri Lankan government rejects any form of hybrid court and permits public stoking of Sinhala nationalist fears of international accountability processes. We agree with the OHCHR that without significant international involvement there can be no credible prosecutions of atrocity crimes in Sri Lanka. Sri Lanka’s domestic legal system is plagued with systemic obstacles to justice, including the politicization of the Attorney General’s department, a judiciary that is deferential to the military, and lack of protections for witnesses. Sri Lanka has failed even on basic confidence-building measures with Tamil victims to address truth and accountability. For more than two years, Tamil families of the disappeared have been protesting across the North and East seeking truth and justice for their disappeared loved ones, many of whom were disappeared after surrendering to military custody in 2009. Despite 2017 promises by President Sirisena to meet the protestors’ demands, he has failed to produce the lists of surrendees and detention centres they seek. The failure of the government to meet the demands of families of the disappeared for fulfilment of the right to truth has resulted in justifiable mistrust in the government’s Office of Missing Persons. 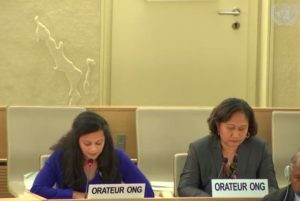 LRWC reiterates the High Commissioner’s recommendations and emphasizes the need for Member States to exercise universal jurisdiction to hold perpetrators of atrocity crimes in Sri Lanka accountable. Only accountability and justice can end the culture of impunity in Sri Lanka that has led to recurrent conflict over the last 70 years. OHCHR, Promoting reconciliation, accountability and human rights in Sri Lanka – Report of the Office of the United Nations High Commissioner for Human Rights, A/HRC/40/23, 8 February 2019, available at: http://ap.ohchr.org/documents/dpage_e.aspx?si=A/HRC/40/23. Human Rights Council, Promoting reconciliation, accountability and human rights in Sri Lanka, Resolution adopted by the Human Rights Council, A/HRC/Res/30/1, October 2015, available at: http://ap.ohchr.org/documents/dpage_e.aspx?si=A/HRC/RES/30/1. Supra note 1, para 51. ‘Issue Brief No.2: Families of the Disappeared and the OMP: Is there a path forward’ Adayaalam Centre for Policy Research, 9 May 2017, available at: http://adayaalam.org/issue-brief-no-2-families-of-the-disappeared-and-the-omp-is-there-a-path-forward/; ‘Sri Lanka: Release lists of the forcibly disappeared, Amnesty International’, 18 May 2018, available at: https://www.amnesty.org/en/latest/research/2018/05/sri-lanka-release-lists-of-the-forcibly-disappeared/.